The phrasing used in insurance policies greatly differ. Interpretations of policies vary from person to person. Negotiation of settlements are aimed at satisfying the interests and views of many, sometimes opposing, participants. With such subjective variables, insurance industry professionals needed a place to discuss issues and educate the general public. Unfortunately, few online resources directly related to claims and settlements were available. Joe Willis of Claim Solutions Pty Ltd. decided that he needed to provide an outlet for all professionals in the industry—so he began to research his options. The idea of sharing, building, and interacting via the Internet left only a few structuring options. After a short deliberation period, Joe quickly realized that a wiki would best suit his needs. Initiate discussions on various topics. Build personal or company profiles. During the search, EditMe stood apart from the competition. “We ultimately decided on EditMe because it has an inviting and easy-to-use interface, accepts multiple users that can be grouped for collaboration, has an intuitive editing window, includes skins which are adaptable, and offers a price that is cost-effective,” says Joe. "I continue to be impressed and surprised by the breadth of EditMe’s services." - Joe Willis, Claim Solutions Pty Ltd. 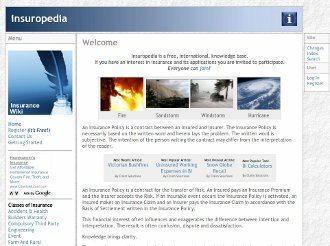 Create an informational website that is accessible to both insurance industry professionals and the general public. Allow professionals to post articles and start discussions while individuals search the database and post questions. Develop a site that allows multiple users to register for an economical price. EditMe’s easy-to use format makes sites feel accessible to all types of end-users. EditMe offers wiki development software that allows registered users to post information and public users to search the database. EditMe features many packages that allow multiple users to register for one low price.